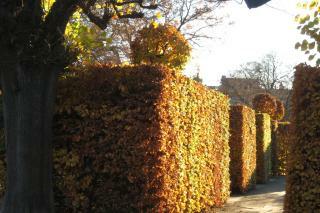 In the early 1600s, a royal kitchen garden and promenading park came into bloom in the middle of Copenhagen. King Christian IV commissioned the clearance of houses and gardens to make way for a summer residence and a garden to furnish the Court with flowers, fruit and vegetables. A generation later, in the 1660s, the Baroque style came into vogue, and the royal gardens were re-landscaped with linden avenues with the noble names of Damegangen (Ladies' Way") and Kavalergangen ("Cavaliers' Way"). But a plan of the park from 1649 reveals that the basic layout of the Renaissance park survived as we know it today. " After the ravages of the Copenhagen Fire of 1795, Kongens Have, now Copenhagen's most popular park, was touched up with elegant Parisian details. The Court sold off a section of the park for new properties and had the grand promenade of Kronprinsessegade constructed at the end of the park. The street and the rest of the city were cut off from the park by stately railings interspersed with sandstone piers. The railings incorporated a series of small Classicist boutique pavilions created by Peter Meyn, the city clerk of works. These small, now listed, box-like interiors were exclusively permitted to purvey fancy goods and other fine wares. The original boutiques had only a doorway topped by a small half-moon window. The large windows seen today were not introduced until the mid-1800s.